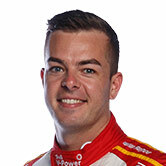 Scott McLaughlin has claimed his sixth ARMOR ALL Pole Position of the 2018 Supercars season, topping qualifying at the Winton SuperSprint. 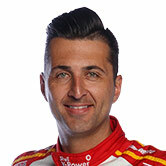 The championship leader headed a one-two for Shell V-Power Racing at the Victorian circuit, and will share the front row with team-mate Fabian Coulthard later this afternoon. Further down the order, the top Triple Eight driver was Jamie Whincup in 11th, and Craig Lowndes could only manage 24th. While most drivers completed a single installation lap before returning to pitlane early, Rick Kelly capitalised on the free air to turn a 1:19.4666s on his first flying lap. That all-but matched McLaughlin’s time to top the preceding Practice 3, but that was bettered six minutes in by McLaughlin himself with a 1:19.1136s. Coulthard slotted into second and Michael Caruso third, while Shane van Gisbergen was fastest of all through the first sector only to fire off at Turn 7. Van Gisbergen sat at the foot of the times with three minutes remaining, one spot behind Andre Heimgartner who had his own Turn 7 spin, as drivers started their second runs. Improvements in the closing stages were limited to the bottom half of the top 10, with no changes at the top. 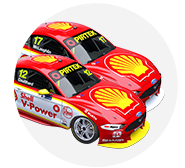 That meant McLaughlin took a 39th career Supercars pole, and fourth in the last five races, by a margin of 0.1283 seconds over Coulthard. “I stuffed the last corner up,” said McLaughlin when asked why he went out for a second run. “I’m always going to say that, you think you can do better, you chase that all the time and my engineer is always pushing me. Second is Coulthard’s first front-row start since the opening race at Albert Park in March. Nissan Motorsport locked out the second row, with Caruso shading Kelly by 0.0436s, the pair both two tenths off McLaughlin. "You’re always frustrated when you’re not the quickest," said Kelly. “[I’m] very happy and grateful for the car speed we’ve got, but I don’t think I did a good enough job out there. I probably could have got another tenth out. “We opted to go straight out on greens and most didn’t and that lap was very good, but just a little bit too much push at the start of the lap without having the car temp that the others probably had in their first run. “It was a good strategy, but I think it cost us a tenth and a half there and that first lap should have been the best. Scott Pye and Tim Slade were the best of the drivers to improve on their final runs, and the lead Holden qualifiers in fifth and sixth, while Mark Winterbottom and Will Davison took seventh and eighth. Ninth and top rookie honours went to Anton De Pasquale, becoming the first Erebus Motorsport driver to out-qualify team-mate David Reynolds, who could only manage 17th. Nick Percat joined Brad Jones Racing team-mate Slade in the top 10 with 10th place, ahead of Whincup, Richie Stanaway and James Courtney, who missed Friday practice. Whincup’s quiet weekend continued, lapping 0.4279s off McLaughlin, while van Gisbergen’s best effort from his second run put him 14th. Lowndes fared the worst of the three Triple Eight Commodores, and will start 24th. “We just couldn’t get the front [tyres] to switch on,” he said. “We went up on the rear spring between the runs, looking to try and kill the rear, but the rear of the car is really good. The opening, 40-lap leg of the Winton SuperSprint starts at 3:50pm local time.